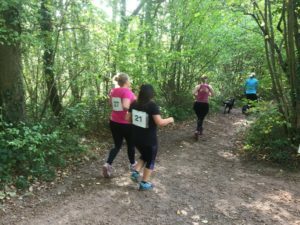 Slightly warm, autumnal weather marked the first Hope Spring 5K Fun Run at Queenswood Country Park, Dinmore Hill in Herefordshire last Saturday morning. The event, which was part of the Energy sustainability festival, saw runners and walkers aged 2 to 76 take to the paths in Herefordshire’s only country park. The event kicked off at 10.00am and began with Richard Evans of Hereford Runners leading the warm-up. He took the fun runners through exercises designed to reduce chances of sprains and strains. Before declaring the start of the race, Hope Spring Water trustee, Temi Odurinde emphasised the importance of safety and reminded runners that it was a fun run and not a race. He added that every participant at the Fun Run would receive a gold medal, whether they came first or last. The 2 lap, 5 Kilometre course started at Lime Avenue and saw participants run through parts of the woods rarely used. After the second lap, participants ran an additional 500 meters to get to the finish line, where the completion time and medals were handed out by Peter Dowsette and Stan Gyford. Many of the runners asked if there would be another Fun Run any time soon. Race director, Temi Odurinde said Hope Spring is in discussion with Hereford River Carnival about bringing the 5K Fun Run to the river carnival in 2018. Hope Spring works with communities struggling to access safe, clean water in sub Saharan Africa. They ran workshops on sanitation and hygiene. You can find more information about Hope Spring at their about us page, found here. You can connect with Hope Spring on their Twitter or Facebook page. Press release distributed by Newsmakers on behalf of Hope Spring, on Wednesday, 18 October 2017. For more information subscribe and follow https://twitter.com/newsmakers_pr .